2 Bedroom Flat For Sale in Manchester for Asking Price £190,000. 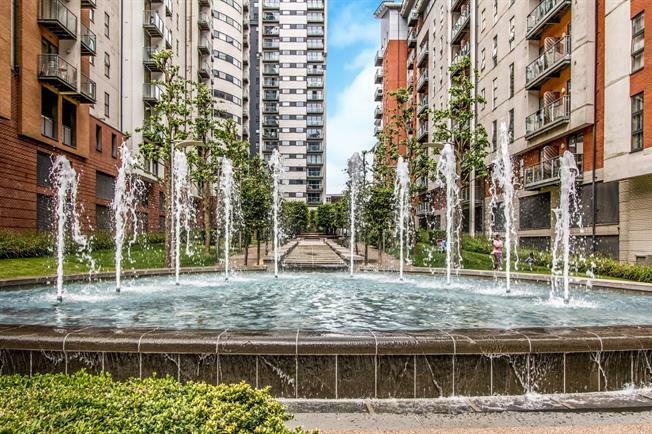 This fantastic 1st floor apartment within the oasis in the city The Green Quarter featuring a balcony . Compromising of a hallway, utility cupboard, impressive front aspect living area with a multi appliance fitted kitchen, two double size bedrooms with an en-suite shower room to the master bedroom, and luxury three piece fitted bathroom. Externally this apartment over looks the communal landscaped gardens with water fountains and neat lawns. The apartment is also complimented with a allocated secure under cover car space. Front . Electric heater, laminate flooring, ceiling light. Wooden sliding double glazed door, opening onto a balcony. Double glazed wood window. Electric heater, carpeted flooring, painted plaster ceiling, ceiling light. Roll edge work surface, fitted and wall and base units, stainless steel sink and one and a half bowl sink, integrated, electric oven, integrated, electric hob, overhead extractor, integrated standard dishwasher, integrated fridge/freezer. Double bedroom; double glazed wood window. Electric heater, carpeted flooring, painted plaster ceiling, ceiling light. Heated towel rail, tiled flooring, painted plaster ceiling, ceiling light. Low level WC, single enclosure shower, wall-mounted sink, extractor fan and shaving point. Single bedroom; double glazed door. Double glazed wood window facing the front. Electric heater, carpeted flooring, painted plaster ceiling, ceiling light. Heated towel rail, tiled flooring, painted plaster ceiling, ceiling light. Low level WC, roll top bath with mixer tap, shower over bath, wall-mounted sink with mixer tap, extractor fan.